As with Part I, the film is directed by David Yates and produced by David Heyman, David Barron and J.K. Rowling. As always, the film stars Daniel Radcliffe, Rupert Grint and Emma Watson, supported by a panoply of top British acting talent, both young and old. 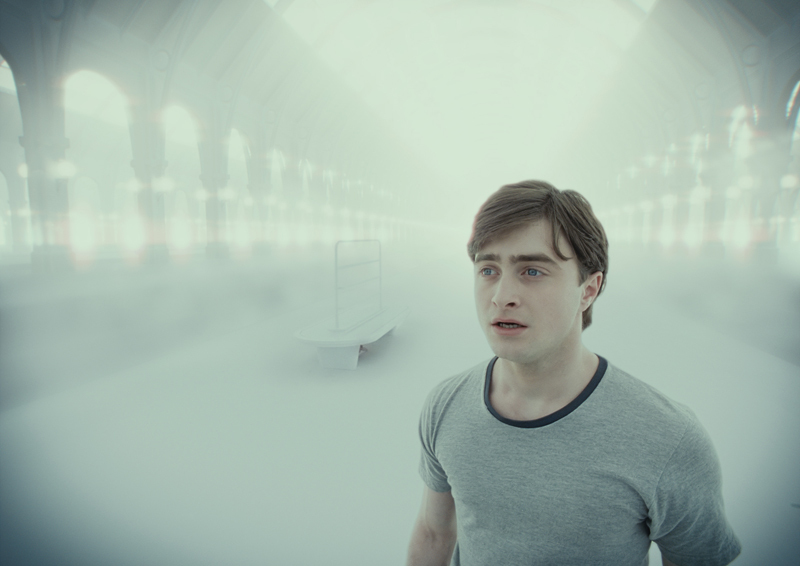 For Framestore, too, Deathly Hallows: Part II marks the end of an era. The company has been a part of the cycle from the outset, contributing to every single film. Framestore’s work has included the deadly Basilisk in Chamber of Secrets, Buckbeak the Hippogriff in Prisoner of Azkaban and Dobby the House Elf’s moving final performance in Deathly Hallows Part I. 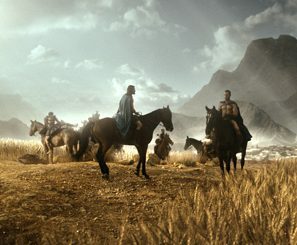 The new film sees Framestore once more facing new challenges, with the company providing a brace of dazzling sequences, as well as – a bittersweet honour and pleasure, claims the facility, helping create the last sequence and shot of this last film. After destroying one Horcrux and discovering the significance of the three Deathly Hallows, Harry, Ron and Hermione continue, in Deathly Hallows: Part II, to seek the other Horcruxes in an attempt to destroy Lord Voldemort. However, now that Voldemort has obtained the Elder Wand, he aims to complete his final stage to ultimate power and launches an attack on Hogwarts School of Witchcraft and Wizardry, where the trio return for one last stand against the dark forces that threaten to take over the Wizarding and Muggle worlds. The first of Framestore’s sequences takes place in the Chamber of Secrets, the underground cave system below Hogwarts, first seen in the eponymous second film of the Potter cycle. 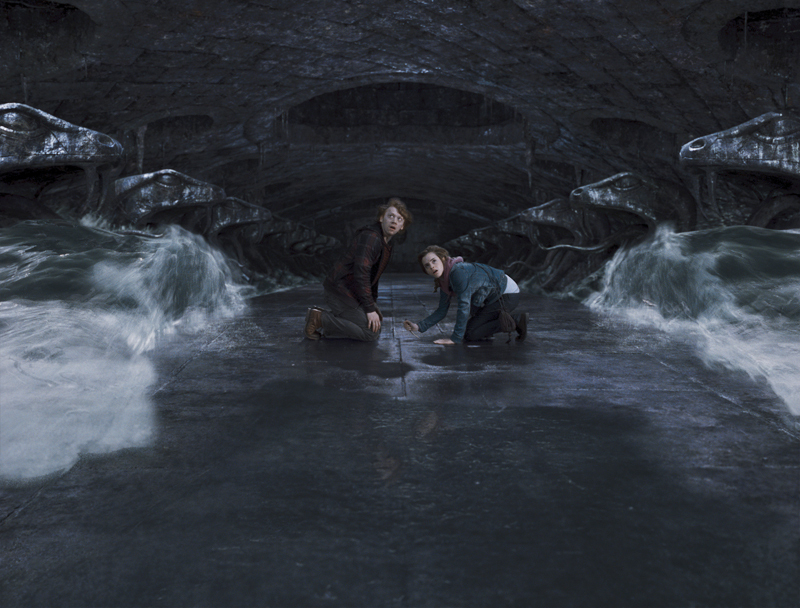 Ron and Hermione return to the Chamber, seeking one of the Horcruxes, which is in the form of a cup. Finding it, they destroy it by striking it with a tooth taken from the corpse of the Basilisk that Harry slew several years ago. 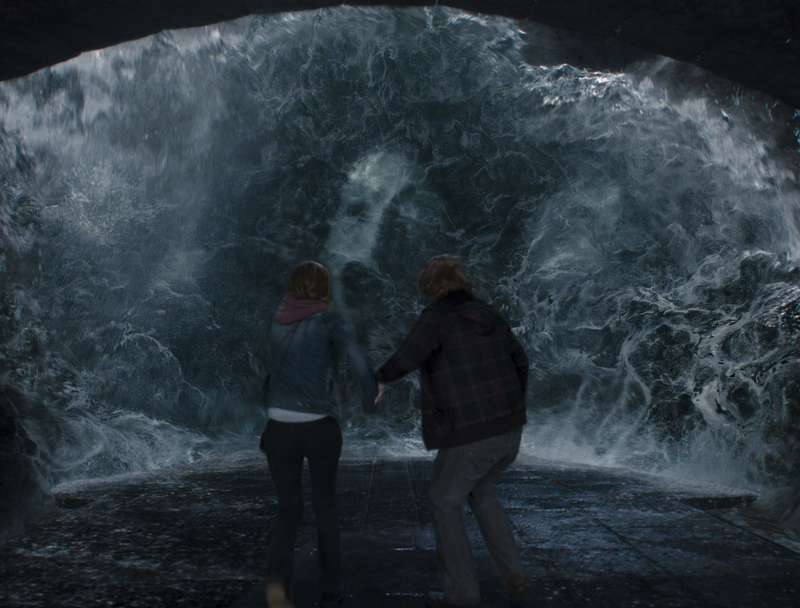 As they strike, the residual malevolent energy possesses all of the water in the Chamber, causing it to rise up (with Voldemort’s face briefly forming in it) and pursue Ron and Hermione through the chamber before running out of energy and collapsing in a huge, drenching splash over them. As the waters recede, Ron and Hermione are moved to express their feelings for one another. Once the main water simulation was completed and ‘baked’, it was fed back into the system for a series of foam and spray passes, also generated through Naiad. These hang off the completed main simulation, with its various attributes driving them. Near the film’s climax, as he finally comes to understand his own nature, Harry Potter surrenders himself to Voldemort, who casts the Killing Curse at him, sending Harry to a limbo-like state between life and death. He finds himself in a version of Kings Cross, but one very different from the station he knows. Everything has a bleached white appearance and the arches and platforms stretch off into infinity. Here he meets and converses at length with Dumbledore, his beloved – but dead – headmaster. Their conversation concludes with Harry’s returning to earth and to battle. The initial brief for this sequence suggested a sort of ‘ice hotel’ feel, with everything somehow there but not there. Harry and Dumbledore were shot on a completely white stage. Harry Potter and the Deathly Hallows: Part II closes with a simple, epilogue-like sequence that takes place 19 years after the events we’ve just witnessed. Harry and his family and friends have gathered on Kings Cross’s legendary Platform 9 ¾ to say goodbye to their children – the next generation – as they head off to Hogwarts, some for their first term. Shot at Leavesden, with green screens and partial set, the final sequence presented no dramatic challenges to the Framestore team. A couple of animations – a chocolate frog and an origami bird – harked back to the earliest films. The platform environment was digitally extended, including some rendering and matte painting, the whole assembled as a photorealistic comp with Senior Compositor Kate Windibank as lead. 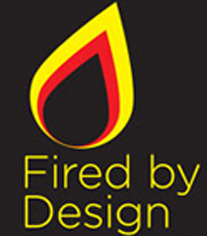 The sequence was delivered to the client in 2D.